I recently had the pleasure of watching Forbidden Planet, a science-fiction film directed by Fred M. Wilcox and released in 1956. A young Leslie Nielsen plays a space captain (Commander J.J. Adams) who is directed to a planet to hopefully find the survivors of a research vessel that disappeared years ago. When he gets there he finds two survivors, the hyper-intelligent Dr. Edward Morbius and his young, beautiful daughter, Altaira (Alta for short) Morbius. Dr. Morbius has created a robot whom he has named Robby. The movie poster (from the Forrest J. Ackerman papers) follows a predictable trope–it depicts Robby menacingly carrying a female figure, presumably Alta, in his arms. Promotional poster for the 1956 film. University of Wyoming, American Heritage Center, Forrest J Ackerman Collection, Collection #2358, Box 124. Much like The Day the Earth Stood Still, the movie poster is not symbolic of the plot of the film. Robby is a helpful robot that is incapable of hurting humans. Instead, he helps humans survive whenever possible. It’s sort of ironic that the only person Robby ends up carrying in the film is a man who has been knocked unconscious. The fact that Robby is neither dangerous nor sexually malevolent in any fashion is telling as to why and how the film was marketed the way it was. People flocked to films that represented wicked alien others harassing, capturing, and holding helpless women. These films were produced in an era of containment when gender performance was ostensibly rigid. Many films reflected this in their representations of strong men rescuing (and seducing) weak women. Forbidden Planet isn’t as severe in its depictions of men and women but still followed the paradigm of having the dominant male (Commander Adams) rescuing an endangered female (Alta). Production still from the film. Forrest J. Ackerman papers, Box 106, Folder 72. American Heritage Center, University of Wyoming. Forbidden Planet was a massive production. The film’s budget was $1.9 million, an unheard of amount at the time for the production of a science fiction film. Many of the science-fiction movies I have been researching were “B” films, created for the sole purpose of putting people in theater seats. “B” films were created as an added bonus to seeing an “A” film with a bigger budget and better-known actors. People found the deal of seeing two films at once irresistible, so showing a second film that was created on a small budget proved to be extremely profitable for movie studios. “B” films had low budgets and were often poorly produced due to short filming schedules. Forbidden Planet was clearly expected to accomplish more than other science fiction films of the time. And from a critical perspective, it did. It’s a great film with a much more thorough attention to plot and aesthetic than the average “B” sci-fi film. Its soundtrack was revolutionary as it was produced completely electronically. Robby the Robot alone cost $125,000. Robby starred in a sequel to the movie, The Invisible Boy. He is now a science-fiction icon. 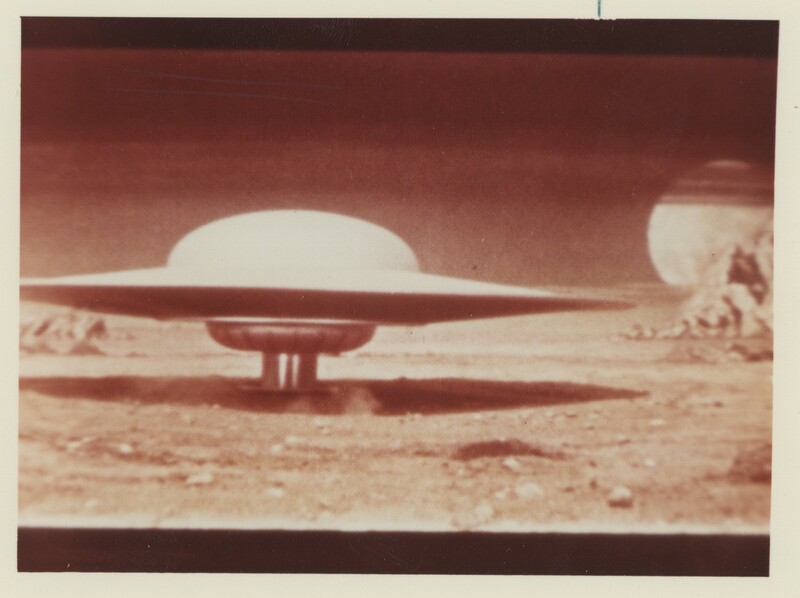 The radical factor that distinguishes the film from other sci-fi films of the era is not its unique production, however, but is instead its unique attention to the human element. There is a dark theme running throughout the film that investigates the ethical place of science in society. Although most science-fiction films of the era employ this theme, there is a human element to Forbidden Planet that tries to reach outside of the gendered aesthetics of the postwar era at the same time that it is employing them, making the film remarkably conflicted and interesting to watch. This entry was posted in popular culture, science fiction, Student projects. Bookmark the permalink. The budget was definitely not B-level. The plot line may be found in Shakespeare’s “The Tempest”.